Do You Have an Image Sharing Strategy? You Need One! The future’s here, and it’s all about the image. We’re drowning in a sea of written content and it’s the kittens, selfies, sunsets and sports shots that are keeping us engaged. The growth of social networks like Pinterest and Instagram are fundamentally changing the way we interact with images. According to Nielsen’s 2012 Social Media Report, Pinterest had year-on-year growth of a whopping 1,047%. Instagram announced that it had surpassed the 100 million user mark in February 2013, handling an almost unbelievable 40 million images a day. Our own research into image-sharing at Slingpic shows a heavy skew towards image-dominant social networks. In terms of engagement with content, articles with relevant images have 94% more views than those without. The same trend is noted in social environments where Facebook posts with images have the highest engagement rate of all posts. From a commercial perspective, images are playing an increasingly crucial role in marketing and purchase behaviour online. The 2012 EMarketer survey showed that 32% of surveyed customers made a purchase after seeing an image on a social image-sharing website. All these fact and figures point to what we all broadly know about images: people love them and want to share them. Images evoke emotion and action and provide a visual summary for the content that surrounds or compliments it. However, visit many websites, blogs or commerce platforms and the lack of image strategy is woefully apparent. To make sure you’re ahead of the game on creating a practical and effective image sharing strategy, we’ve shared a few tips and considerations to start the ball rolling. Sounds obvious, but good quality images that really sum up a broader story go a long way to creating both interest and a broader perception around your site. Think carefully about what an image actually says about your content. Does it enhance the story you’re trying to tell? If it was isolated from the primary content or aligned to 138 characters of text, would it still make sense? If your budget allows, ditch stock images in favour of specially commissioned professional photography of key visuals. If the image is going to circulate in the social sphere, make sure it’s the best possible portrayal of your site and brand. Women currently dominate image sharing. According to a 2012 Pew research survey, they are more likely than men to post photos to any kind of website. 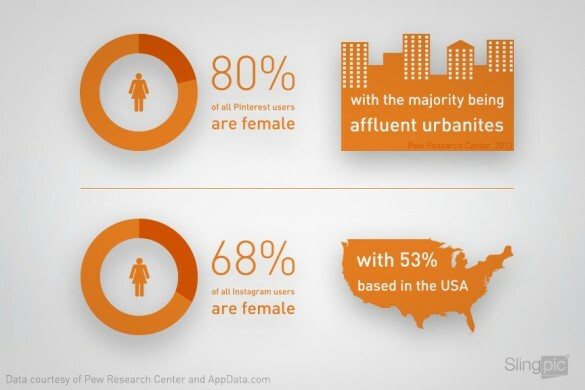 Pinterest’s audience is 80% female and skews towards affluent urban and suburban households. Instagram, too, skews towards urban based women. Consider this audience trend in image sharing if you are looking to encourage greater sharing of your visual content beyond your site. Your audience focus may be skewed to other audiences so utilize website analytics tools and social monitoring tools to understand where inbound traffic may be coming from and allow you to infer demographics of consumers and sharers of your image content. For example, at SlingPic we have built in analytics to let you know what images are garnering the most attention. Images are a powerful way of summarizing longer form content. If, for example, you have a Facebook page to complement your main site, consider using a high-impact image as a visual hook to drive traffic through to a longer feature on your website or blog. Coordinate your times for posting of images to social channels to coincide with the posting of content on your site. Also consider the mechanics of how the content will get into social channels. Most people cut and paste links, which is very clumsy and prone to error and in turn traffic drop-off. Building in simple, easy to use image-sharing functionality vastly improves the quality, quantity and measurability of how people share images. 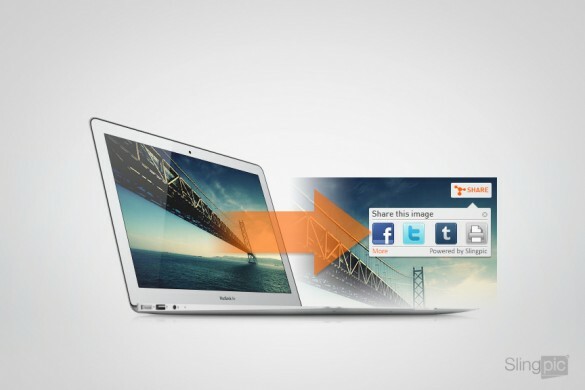 At Slingpic we’ve created a one-click image sharing widget that makes it easy to share visual material into social platforms and benefit from return traffic to the location of the image. If you have a carefully curated image and written content approach, make sure you don’t waste the opportunity to capitalise on interest and traffic should that content be shared in social platforms. In our content saturated and time starved era, conveying ideas and figures with pretty pictures has proven a very effective way of getting a summary of your ideas over to people! Infographics are also a solid way of making your content portable while retaining the integrity of the source. If a visitor to your site shares your infographic into social channels, you benefit from the correct story being told and from additional traffic coming back into your site for more information. Infographics are now incredibly cheap to produce and there are even automated tools to enable you to produce them online, if you don’t have the required design skills or resource in-house. What About Copyright And Permission? Are the images yours? If so, accept that putting them online will reduce your ability to control copyrighted use of them. Some image owners use image watermarking or disable the right-click-save function. At Slingpic we include an optional function to include a copyright notice when image content is shared from a site. Whilst all these steps are useful, they don’t provide an iron-clad guarantee of correct use of your images, but that has to be weighed up against the increased profile and web traffic you might generate by making images available. If you are using other people’s images and want to play it safe to avoid any legal issues, ask for permission to use the images or buy stock photography. If you are using other people’s images without their permission you will need to understand the nuances of fair use. Simply citing the source of the image is often not enough to protect you. Seems an obvious one, but given how images are now becoming such a big part of site content, it’s still astonishing that people don’t follow the basics for image SEO. Make sure you have a relevant alt attribute description with all the important keywords included. The same goes for the file name. Lastly, keep in mind a balance between image quality and file size. Page load time is still an important component in search rankings for Google so make sure you retain the quality of your images while keeping file size in mind. ‘Images as content’ is currently one of the hottest issues for marketers, publishers and bloggers, and for good reason. Visuals are emotive, can provide a powerful summary, context and signposts for a broader story, and have the ability to actively drive interest and action. Having a clear strategy for how you approach images on your site as shared and social content is crucial. Understanding what their purpose is and when and where to use them is becoming a prerequisite for good site creation and management. To paraphrase Allen Ginsberg, whoever controls the images, controls the culture. Slingpic is an image sharing widget that makes it easy for site visitors to share your images across their favorite social platforms. Improve your social media presence and benefit from new traffic to your site.